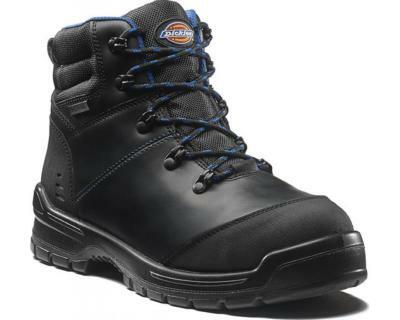 The Dickies Cameron Safety Boot is a smart and durable safety boot which is new for the 2018 collection. The Cameron boot benefits from a composite toe-cap and non-metallic midsole anti-penetration protection. The padded collar and tongue along with the removable foam insole will give all round comfort whilst the waterproof membrane will ensure you stay dry. The Cameron boots have an outsole that is slip resistant to SRC standards and is both fuel & oil resistant.